Thousands of travelers are staying in rentals this summer booked on the popular site Airbnb, but the NBC4 I-Team found evidence of problems that some say spoiled their vacations. "We don't have a family vacation this summer because of Airbnb," Lisa Rozas told the I-Team. Last February, Rozas and her wife Sue Davis booked a beach house in Rhode Island for a July vacation with their 8-year-old twins, and received a message saying their "reservation is confirmed." But four months later, in June, the couple heard from the host of the house, who called himself Alan, that the rental was no longer available the week they booked it. They found he had rented it to another family for twice the price, a violation of Airbnb policy. "It was clear from the start that this guy wanted more money and that Airbnb was going to support him," Lisa Rozas told the I-Team. Airbnb says the vast majority of users of its site are satisfied with their bookings. But the I-Team found many other travelers complaining of problems, in addition to cancelled reservations. "It's really heartbreaking," said Rhonda Petrarca, who rented an Airbnb listing in Woodland Hills to stay at during her son's wedding and to host the rehearsal dinner. "We walked in and it was an instant 'Oh my God.'" Petrarca said the home looked great in photos on the Airbnb site. But she says when she showed up, she found holes in the living room walls with exposed pipes, rotting wood, bedroom doors that were smashed in and rotten food left on the barbeque. She gave the I-Team photos to back up her complaints. She messaged the host, who sent a maid to clean up the home. But Petrarca told NBC4 it was still in bad shape. "It was a huge disappointment and it really overshadowed my son's wedding," Petrarca said. Petrarca didn't reach out to Airbnb. The I-Team contacted her host, David, who told us he addressed Petrarca's concerns and said he has more than 10 five-star reviews of his home. But even Airbnb homes with glowing reviews often have unhappy visitors, the I-Team found. "You expect hot water if you're going to pay so much in the Hollywood Hills," said a group of 11 Australians who rented a home on Airbnb this past April from a host named Alex. The group told NBC4 the hot water didn't always work and some of the lights weren't always working. "Half of the bedroom lights don't actually turn on," one of the Australians said, who chose not to complain to Alex. But I-Team researchers discovered other problems when they rented a few of Alex's other Airbnb properties. Alex listed a "Downtown LA Exclusive" apartment, with a picture of a chic rooftop pool area. The rental was at the Eight & Grand Apartments, but the I-Team discovered that picture of the rooftop pool was actually lifted from photos of the trendy Standard Hotel downtown. "We do not tolerate hosts having misinformation on their listings and we will absolutely be looking into this issue," said Airbnb spokeswoman Connie Llanos when NBC4 questioned her about the photo. And an I-Team researcher rented another of Alex's listings, the "Hollywood Penthouse," a unit at the La Belle Apartments on Franklin Avenue. But when the researcher checked into the penthouse, she found grease stains on the walls and carpet, and lipstick and hair on the sheets on two beds, which apparently had not been changed from the previous guests. And the I-Team found that Alex never disclosed the addresses of his rentals, even after guests paid in full. 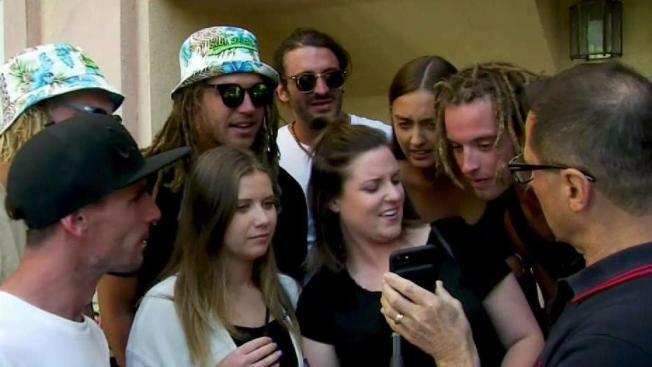 Those Australians were told to meet Alex's assistant in the parking lot of a nearby liquor store to get the address and keys to their Hollywood Hills rental. And Alex told our I-Team researcher to meet his assistant at a Mobil gas station, next to a homeless encampment, in order to get the keys and location of the "Hollywood Penthouse." "What I can say is that there are concerns with this listing and this host that we definitely want to look into," Llanos said. After the I-Team brought these issues to Airbnb's attention, they say they shut down Alex's account. And Airbnb says it has customer service reps available 24/7 "to help make things right...in the rare event an issue might arise." But Rozas and Davis say Airbnb didn't make things right when they complained to the company that their host, Alan, cancelled their reservation just weeks before their summer vacation. They say Airbnb offered to find them a similar rental, but there were none available in the price range and the time they had planned their vacation. They say in the end, all they got was a 10-percent off coupon on a future rental. They say next time they'll use another site or service other than Airbnb to book their vacation. "It's just not worth it for the chance that it's going to mess up your entire plans for the summer," Davis told NBC4.